Philadelphia TV’s Dr. Shock came along at just the right time to help me through one of those painful “growin’ up” stages. I wasn’t a particularly popular kid at Holy Rosary School in the Diocese of Camden. The girls didn’t like me because I wasn’t cute or athletic. The boys made fun of me because I was such a spaz at sports. I wouldn’t call my childhood miserable, exactly; but I always felt kind of unliked, you know? I escaped into horror movies. Dr. Shock was a hero. No matter how disappointing my life was during the school week, I knew that on Saturday, “Shocky Doc” would show a monster movie of some sort. Sometimes the movies stunk, but that didn’t matter. Dr. Shock could be counted upon to show you a monster movie. “Diary of a Madman” starring Vincent Price and Nancy Kovack was the first movie ever aired by Dr. Shock. The following is from memory: Dr. 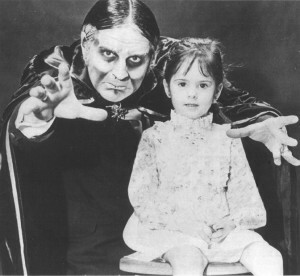 Shock debuted at 11 or 11:30 p.m. on Saturday, March 7, 1970, on WPHL Channel 17, a UHF channel in Philadelphia. The program was called “Scream-In,” a play on “Laugh-In,” which was itself a play on the hippie term “Love-In.”I remember clearly the first “Scream-In.” Dr. 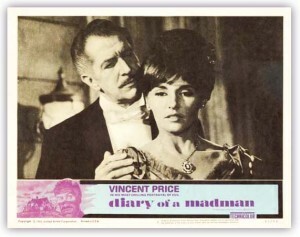 Shock showed Reginald Le Borg’s “Diary of a Madman” (1963) starring Vincent Price, a color film. It was … okay. I haven’t seen it since, but I still remember the mantra of the movie: “Hatred is evil.” Vincent Price was running around in a big old house, acting all crazy. Sculpture somehow played into it. To accompany “Diary of a Madman,” Dr. Shock did an episode-long skit in which he repeatedly tried to revive the Frankenstein monster (a guy laying on a slab wearing a Frankenstein mask, probably a Topstone job). Dr. Shock tried all sorts of things, jumper cables and whatnot, but nothing worked. Finally, he had an inspiration. He played a 45-RPM of Tiny Tim singing “Tiptoe Through the Tulips.” This enraged the heretofore dormant monster, who suddenly came to life and groaned in protest. A good joke. “Brain Eaters” and “Invasion of the Saucer Men” — what a great way to kill three hours. At first, I thought Dr. Shock was the same guy who played Captain Noah on a vaguely religious Sunday-morning kiddie show on Channel 6. (Both men spoke in that same scrapple-thick Philly accent.) I tuned in the next morning and concluded that it wasn’t the same dude. On the second week, Dr. Shock showed Roger Corman’s “Little Shop of Horrors” (1959) starring Jonathan Haze. I remember thinking that this movie represented a real drop in quality from the previous week. Of course, I’ve since come to love “Little Shop,” as have we all. Like Roland before him, Dr. Shock put out a 45-RPM. In the beginning, “Scream-In” was using Harry Lubin’s eerie-as-hell theme “Fear” from the “One Step Beyond” soundtrack over its closing credits. (I’m sure this was “stolen.” Some schlub at Channel 17 probably owned a copy of the soundtrack album.) Dr. Shock did comedy with an assistant named Boris who had a protruding monster eye. Dr. Shock would beat Boris with a rubber chicken. Another charming thing about Dr. Shock’s show was its advertisers – usually local Philly entrepreneurs grabbing a moment in the spotlight. The best was Krass Brothers’ Men’s Store, the “store of the stars.” (What stars? Larry Ferrari? Happy the Clown?) A funny little man in a suit would say something like, “If you don’t buy your clothes from Krass Brothers’ Men’s Store, you’re all washed up!” And then he would get buckets of water dumped on him. Every week, the gag would change. Me and my little brother came up with vulgar alternatives which I won’t share. The Dr. Shock blackout: It’s an often-reported story that after 13 weeks, Channel 17 took Dr. Shock off the air, triggering a fan uproar. But I remember some specific things about the first Saturday night without Dr. Shock that I’ve never seen reported elsewhere. Joe and Doreen Zawislak land on the cover of the Camden Courier-Post’s Sunday TV insert. A lot of the memories I’ve just described are thanks to listening to that long-gone tape. Also, I can tell you what movie this weird host aired: “The Boogie Man Will Get You” (1942), a horror comedy starring Boris Karloff and Peter Lorre. Can anyone out there verify any of this? I’d swear it on a stack of bibles. But Dr. Shock soon came back, reportedly after Channel 17 received 10,000 letters of complaint (which sounds apocryphal). 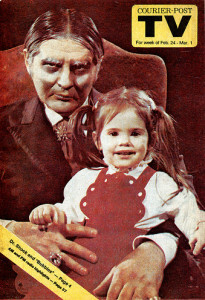 When he returned, he brought along his real-life daughter Doreen. She was not yet a toddler. The theory was that if kids saw Dr. Shock interacting with a baby, how scary could he be? Dr. Shock called her “Bubbles,” after “Scream-In” sponsor Bubbles Booth soda, a brand found only in Philadelphia. You haven’t lived until you’ve chugged Bubbles Booth’s black cherry wishniak flavor soda. (No, I don’t know what “wishniak” means.) My dad, a Philly guy through-and-through, used to bring Bubbles Booth soda home from work. It was bottled, not canned, and came in these old-fashioned wooden crates. The company, like much of the Philadelphia of Charles’s day, is no longer there. Because when it came to the quality of horror films, Dr. Shock was very democratic; he showed everything. All of the Universal classics. All of the crazy Mexican movies. All of the 1950s American International Pictures cheapies. And everything in-between. This was key. Faithful viewers of Dr. Shock greatly expanded their horror-film scholarship. I got to see the Universal classics for the first time thanks to Dr. 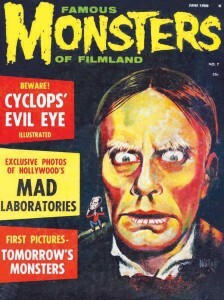 Shock, after years of reading about (and pining away for) them in the pages of Famous Monsters of Filmland. When Dr. Shock aired “Dracula” and “Frankenstein” in one Saturday night double-feature, it was a revelation. So many questions were answered that night. The worst, worst, worst movie Dr. Shock ever showed was “Cry of the Bewitched” (1957). It was frickin’ terrible – just a bunch of voodoo drums and nothing happening. I’d give anything to see it now. Dr. Shock apparently enjoyed making personal appearances. Dr. Shock live: I saw Dr. Shock in person twice. The first time was Halloween of 1971, a Sunday afternoon. It was at Cherry Hill High School East the year before I attended that very institution of learning. One of my parents must have dropped me off; I was by myself. When an announcer said, “Dr. Shock … is in his coffin,” a chill went down my spine. A curtain (decorated with cherries for “Cherry Hill”) parted, and sure enough, there was a coffin onstage from which the man himself emerged. 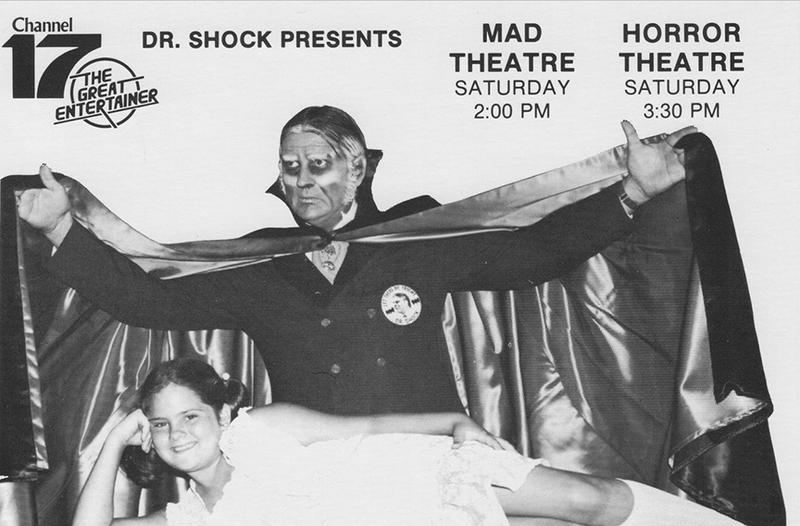 I don’t remember much about Dr. Shock’s act that day. I’m sure he told bad jokes and did magic. I do remember he turned a couple of “monsters” loose into the audience – guys dressed up as Frankenstein and the Mummy, wearing Don Post masks. Dr. Shock did his fake laugh as the monsters interacted with kids in the audience. I went over and gave Frankenstein a pat on the back. Somehow, I hung onto the photo Dr. 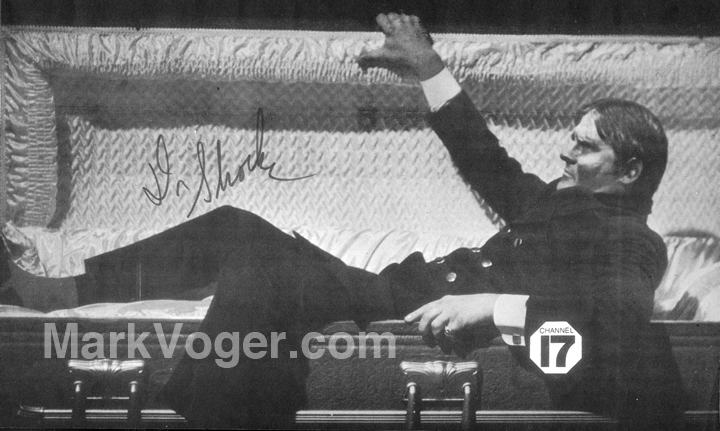 Shock autographed for me in 1971. At the end of the gig, Dr. Shock signed autographs of photos he brought, and I got one signed. As he was leaving the stage, I tried to talk to him. I didn’t verbalize it well, but I tried to ask him if he had already taped the show that was to be broadcast that night. (The movie, I knew, was going to be “Calling Dr. Death” starring Lon Chaney Jr.) Dr. Shock turned, looked at me and said, “Hah?” like an impatient old man in a hurry. I repeated the question, but I probably mangled it just as badly. He said something – I don’t remember what – that seemed like a reply, and then left the stage. I had my Dr. Shock moment, such as it was. The second time I saw Dr. Shock was at a summer fair of some sort. My mom took me, my sister Bobbi and my little brother Brian. I brought along something to ask Dr. Shock about. It was an ad for back issues in Famous Monsters of Filmland. It showed a guy who looked exactly like Dr. Shock, but it said he was Roland. This confused me, because my big brother Bud (who was 19 years older than me) always used to tell me about a cool monster guy on TV named Roland who, like Dr. Shock, showed monster movies. Could Roland and Dr. Shock be the same guy? I actually got close enough to Dr. Shock to point to the image in the magazine and ask him, “Is this you?” Dr. Shock squinted at it and said, “That’s my cousin.” I got my answer, kind of. At the time, I thought Dr. Shock was just being flip, that he didn’t know anything about the image I’d shown him. But years later, I learned that Dr. Shock, like my big brother Bud, had been a huge Roland fan, and that Channel 17 actually asked John Zacherle – the man who earlier played Roland – if Dr. Shock could wear his makeup. Zacherle gave his permission, which isn’t surprising, because Zach is one of the nicest guys on the planet. Dr. 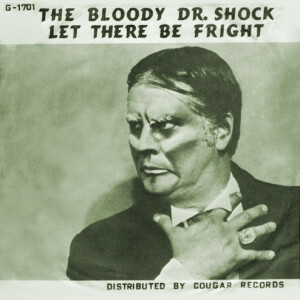 Shock wore his “Let There Be Fright” button on TV and at personal appearances. I owned one. Where is it now? As the ’70s shucked and jived along, I shed some of my nerdiness. When I entered high school, I joined the jocks (despite my lack of athletic ability); by graduation in 1976, I’d joined the stoners (the music was better). I was a college boy on a bus one chilly night in 1979 – I think it was the fall — riding through campus when I saw a discarded copy of the Philadelphia Daily News proclaiming, on the front page, that Dr. Shock (real name: Joe Zawislak, a Manayunk magician) was dead at 42. I realized that for the last few years, I had watched him only rarely. I felt bad about that, like I’d taken an old friend for granted. So I’ll say it again: Thank you, Dr. Shock.